When Liberty Ale was released in 1975 it changed the world of craft beer. Brewed to celebrate the 200th anniversary of Paul Revere’s midnight ride, Liberty Ale was the first American IPA brewed after prohibition. This revolutionary forerunner of the modern IPA introduced America to the Cascade hop and the nearly lost art of dry-hopping, a steeping process to infuse beer with bold hop aromas. 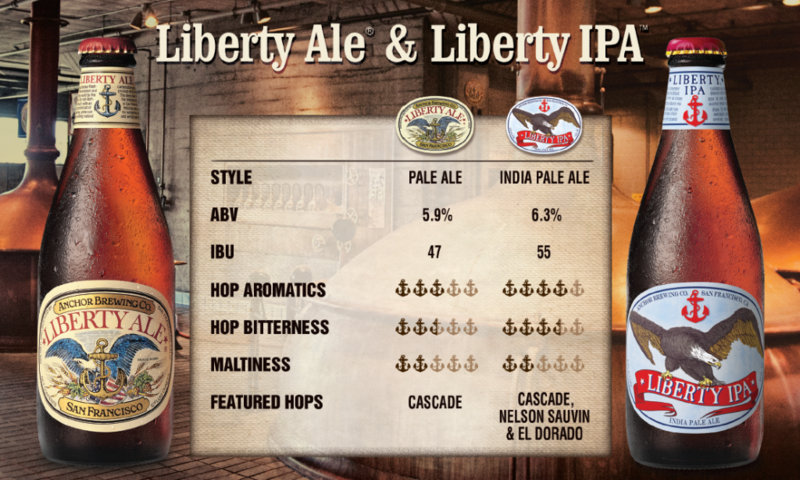 Liberty IPA is Anchor’s reimagining of the craft beer classic Liberty Ale, envisioned through the lens of today’s IPAs. This new release is a celebration of the Cascade hopped IPA’s that Anchor first popularized back in 1975 and remain at the forefront of American craft beer trends. “But what’s the difference between the two,” you may ask. Well, that’s what we’re here to explain. For starters, check out the chart below comparing the two beers. Let’s start with the malt, since that’s the first ingredient brewers work with when making beer. Liberty IPA is 100% 2-row pale barley malt just like Liberty Ale, however it is brewed at a higher original gravity (meaning the wort contains a higher density of fermentable sugar) to give us more alcohol down the line. It also has a different mash profile to give it more fermentability and a drier finish. Now for the hops! When brewing Liberty IPA we use a blend of the classic Cascade hop along with Nelson Sauvin in the brewkettle to give the beer a nice lively bitterness. At 55 IBUs (international bitterness units) it is more bitter than Liberty Ale, but still balanced well with the malt character. The way we dry-hop these two beers significantly differentiates them from one another. When making Liberty IPA we use different hops, more hops and a different dry-hopping technique to achieve a bright, citrus and pine hop aroma that is reminiscent of Liberty Ale, but much higher in amplitude. While Liberty Ale is solely dry-hopped with Cascade, Liberty IPA is dry-hopped with El Dorado and Nelson Sauvin in addition to Cascade. Liberty Ale is dry-hopped using traditional mesh bags that steep in the cellar tanks. Liberty IPA, on the other hand, uses an innovative dry-hopping technique that uses flow-through technology in a custom cellar tank. 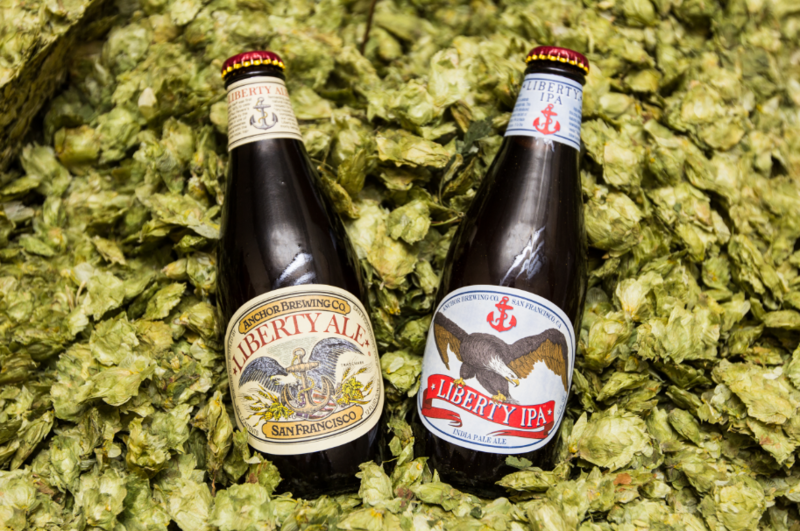 Liberty Ale is a revolutionary beer and has a dear place in the hearts of many craft beer fans. It’s an icon in craft beer history, helping ignite the American Craft Beer Revolution, and is still just as relevant and tasty today. 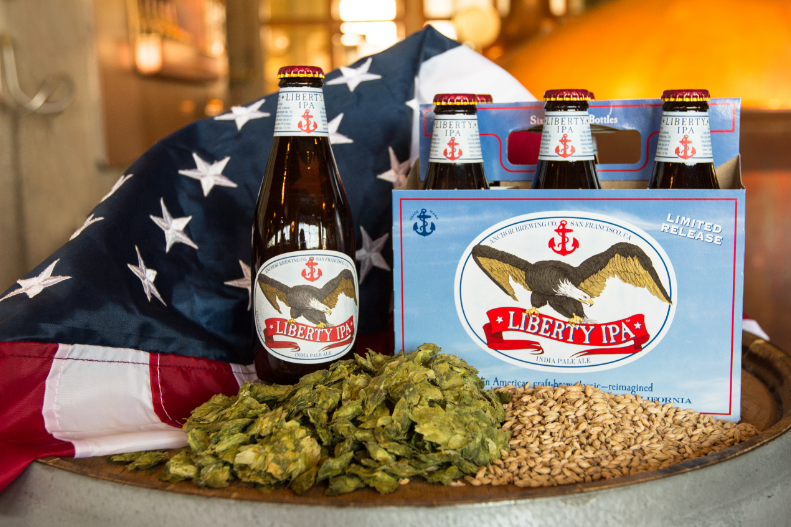 Liberty IPA is a deliciously hoppy, modern twist on this craft classic and we hope you enjoy it! We sure do!